Earlier this week Google announced their “own” eReader device. 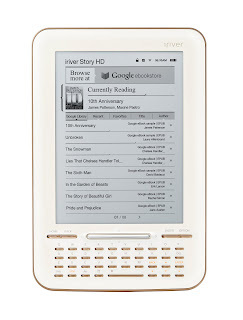 They have commandeered the iriver Story HD, which has already been around for a while, and added some built-in Google Books functionality to it, and are now going to be selling it at Target for $139.99. Before this, you could use ebooks from Google on your computer or many devices (iOS, Android, etc) by downloading the ebook and then sending it to the device. This is different because you can use the iriver Story to wirelessly download ebooks directly to the device. According to the Google blog post, this is just the beginning. They’d like more eReader developers to work in WiFi access to Google Books on their devices as well. A while back I tested the Google eBooks system and wrote a post with details about it. I liked how it worked. I read a book or two in the Google Books app on my iPhone and was pleased with it. It would be useful to be able to download ebooks directly to an E-Ink eReader if you were already doing most of your e-reading on that type of device. I think it would be great if eReader manufacturers could add this into already-existing devices, perhaps in firmware updates. That way people could choose to make use of their current downloading system as well as Google Books. I doubt they will do that right away since that would reduce any need for buying this iriver device, but perhaps it will happen a little later on. I recently wrote up an overview of how you can use the Google eBookStore. The ebooks come in PDF and EPUB for a variety of different devices with the Google Books app, or use on the web. Go directly to the free ebooks. eBookMall has a section devoted to free ebooks. All are ebook downloads that are totally free. It seems like some are only available for a limited time, as a promotional effort by authors or publishers. Project Gutenberg has been around for a long time. They started with OCR scanning of public domain books into .txt files, and now they have available HTML, ePub, Kindle, and more. You can get a ton of ebooks for free from Amazon in Kindle format. Like the paid ebooks, you can use them on a Kindle device or in a Kindle app for your computer or other devices. Go to amazon.com/kindle-ebooks/ to get to the Kindle eBook Store, then find the Top 100 Free listing on the right side of the page, a little ways down. These ebooks aren’t downloadable, but there is a nice selection of classic popular texts that you can read free online. Useful for school projects or study, if they have what you need. The BeBook store has 20,000 free classic titles available for download. The free ebooks come in plain text and PDF, and can be used on any computer or device.